Andrew Vanbergen, coffee enthusiast and inventor of preposterous excuses, is struggling to start a bed and breakfast with his wife Rose when Jules Pennyman comes along to rent a room. Pennyman, in order to command the magic collectively contained in thirty ancient silver coins, is trying to gather them together. These coins, though, must, for the sake of the world, be kept separated. The last time they were together they were paid to Judas for the betrayal of Christ. 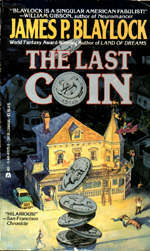 Andrew and his friend Beams Pickett become players in the fight to keep the last coin, of which Rose's irascible Aunt Naomi is, to Andrew's astonishment, the guardian, out of Pennyman's clutches. They have some surprising allies: possums, spoon-bearing pigs, and old Uncle Arthur, whose connection with the coins goes way, way, back.